This streamline map of IMD shows a perfect development of the south-westerlies in both, the Arabian Sea and the Bay segment. The picking up of the wind speed in the Arabian Sea segment, near Sri Lanka and southern region, is due to the increase in the gradient in the pressure, as the monsoon low gets estabished in the Rajasthan region. The heat is prevailing in the "core" area, as seen in the map. Now, the winds and cloud formation in the central sea is bound to gain in strenght, as the Somali Current is prevelent. This is seen in the commencement of the water sst cooling off the Somali coast. 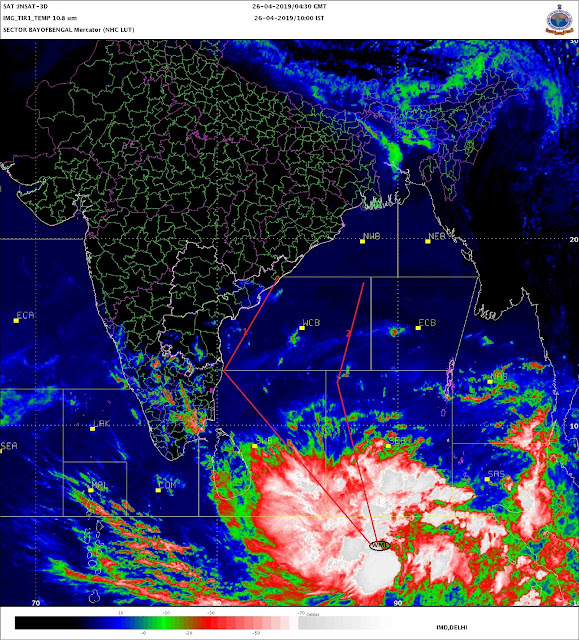 Resultantly: Pre Monsoon thundershowers have started rumbling along the southern parts of the west coast of India. Karnataka and interior Maharashtra also have started getting pre monsoon thundershowers. This "pre monsoon thunder" precipiation will continue in coastal /interior Karnataka, Goa and Kerala, till the actual monsoon current advances into Kerala around the 27th./28th. of May. Before that, the monsoon will progress into Sri Lanka around the 23rd. From there, after hitting Kerala, the monsoon's advance needs to be monitored, as there are some indications of the progress slackening a bit. In the Bay, after an initial delay, the monsoon has again started progressing towards the south islands. The normal date for the monsoon in the south islands is 20th. May.